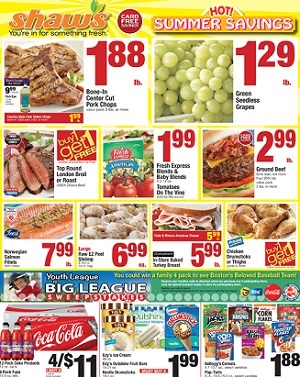 Find the latest weekly ad circulars, coupons and sale specials for Shaw’s. You can always count on Shaw’s for great savings & promotions on fresh produce, meats, dairy products, essential home goods, beauty products and more. Check for great savings on: Bone-In Center Cut Pork Chops; Top Round London Broil or Roast; Fresh Express Blends & Baby Blends; Tomatoes On The Vine; Chicken Drumsticks or Thighs; Edy’s Ice Cream; Kellogg’s Cereals; Green Mountain Bagged Coffee; Keebler Cookies & Crackers; Freihofer’s Country Breads; Chicken Of The Sea Solid White or Chunk Light Tuna; Xtra Laundry Detergent; Turkey Hill Iced Tea; Dannon Oikos, Activia or Light & Fit Greek Yogurt; Richie’s Italian Ice; Hunts Diced or Fire Roasted Tomatoes; Alaskan King Salmon Fillets or Boneless Ahi Tuna Steaks; Boneless Swordfish Steaks; Boneless Haddock Fillets; wild harvest Fresh Chicken; Prince Edward Island Live Mussels; Shadybrook Farms Hot or Sweet Italian Turkey Sausage; Boneless Beef Country Style Spare Ribs; Filippo Berio Extra Virgin Olive Oil; Ragu Pasta Sauce; Essential Everyday Instant Rice; Progresso Traditional or Classic Soups; Tide Laundry Detergent; Friskies Canned Cat Food; Herbal Essence Shampoo & Conditioner; Aim or Pepsodent Toothpaste; Right Guard Invisible Solid; Driscoll’s Raspberries or Blackberries; Sweet Vidalia Onions; Organic Peaches or Nectarines; Fresh Figs; Red or Yellow Mangoes; Golden Ripe Pineapple; and more. Shaw’s stores activate their latest weekly circular every Friday. Shaw’s is a grocery store chain based in West Bridgewater, Massachusetts, employing about 30,000 associates in 137 stores. The stores a located in Maine, Massachusetts, New Hampshire, Rhode Island, and Vermont.